How are evaluation findings actually used? 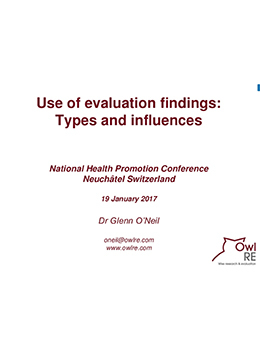 This presentation by Glenn examines what are the different types of evaluation use and what influences use. Originally presented at the Swiss National Health Promotion Conference, 19 January 2017. 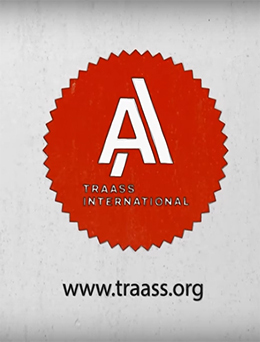 Presented by Glenn O’Neil on the TRAASS Learning Platform, this online training course focuses on the key product of an evaluation: the evaluation report. In this course, students will learn best practices for effective and creative report specific to evaluation reports. Learning points and practical exercises are combined to develop skills in putting together an effective and engaging evaluation report. This case study examines the evaluation of the impact of a major conference on its participants. 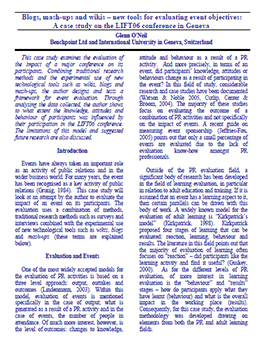 Combining traditional research methods and the experimental use of new technological tools such as wikis, blogs and mash-ups, the author designs and tests a framework for event evaluation. 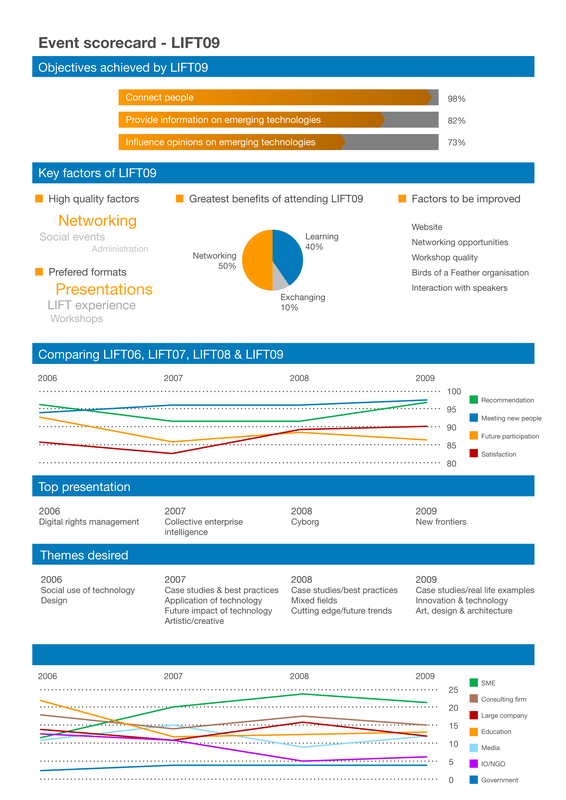 Through analysing the data collected, the author shows to what extent the knowledge, attitudes and behaviour of participants was influenced by their participation in the LIFT06 conference. The limitations of this model and suggested future research are also discussed. Abstract: This article presents a study on the pathways and processes regarding the use of evaluation findings of communication campaigns from two international organizations, the Office of the High Commissioner for Human Rights (OHCHR) and the International Committee of the Red Cross (ICRC). 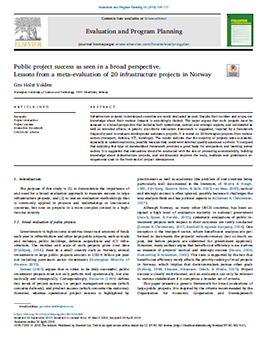 Several years after the completion of the campaigns and their evaluations, our research identified 28 instances of use and six instances of non-use of the evaluation results, of which the large majority being surprising in nature. 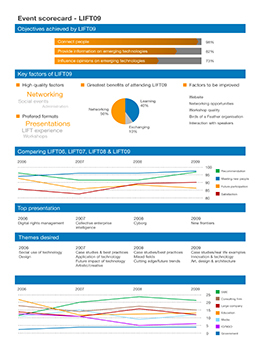 This infographic provides an overview of the evaluation findings of the 2009 Lift Conference, a leading communication and technology summit in Europe.